If you have ever driven at dusk behind a Morgan with original incandescent bulbs in the rear lights then you likely understand the primary motivation for converting to LEDs: for safety, to enhance our visibility. This new technology is much brighter, consumes far less power, and should operate with much longer life. Moreover, a Morgan owner who is concerned about preserving absolute originality will be able to perform this conversion such that it is completely reversible. 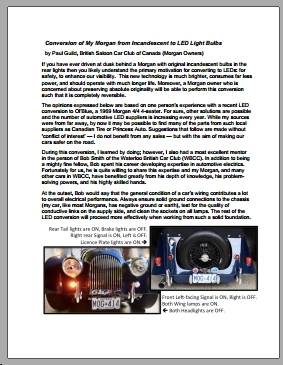 The opinions expressed below are based on one person’s experience with a recent LED conversion to Ol’Blue, a 1969 Morgan 4/4 4-seater. For sure, other solutions are possible and the number of automotive LED suppliers is increasing every year. While my sources were from far away, by now it may be possible to find many of the parts from such local suppliers as Canadian Tire or Princess Auto. Suggestions that follow are made without ‘conflict of interest’ — I do not benefit from any sales — but with the aim of making our cars safer on the road. During this conversion, I learned by doing; however, I also had a most excellent mentor in the person of Bob Smith of the Waterloo British Car Club (WBCC). In addition to being a mighty fine fellow, Bob spent his career developing expertise in automotive electrics. Fortunately for us, he is quite willing to share this expertise and my Morgan, and many other cars in WBCC, have benefited greatly from his depth of knowledge, his problem solving powers, and his highly skilled hands. At the outset, Bob would say that the general condition of a car’s wiring contributes a lot to overall electrical performance. Always ensure solid ground connections to the chassis (my car, like most Morgans, has negative ground or earth), test for the quality of conductive links on the supply side, and clean the sockets on all lamps. The rest of the LED conversion will proceed more effectively when working from such a solid foundation. My successful shopping experience was with three suppliers: (a) Moss Motors (US, at www.mossmotors.com and 1-800-667-7872), (b) 4Sight Lighting Co (UK, at www.bettercarlighting.co.uk and 011-44-121-773-7000 – ask for Gil Keane who is a car guy); and (c) Banggood is a relatively low-cost supplier of many things including automotive LEDs for external use (China, at www.banggood.com/search/led-1156-cob.html). From these sources, seven lighting sub-systems were located. My car has the early style Lucas L516 bullet side wing lamps. Last year, my initial LEDs (BA9S) that I inserted into the L516s were too long so that they touched the back of the lens, and within one year, vibration caused one LED to fail. Thus, I went looking for an LED with a shorter barrel. Acting on a tip from Mike Pullen of Morgan Historic Registry, I located 233 COBs 12V 1.5 watt uni-directional bulbs from The 4Sight Lighting Co in UK. These fit the L516s with ample clearance and create very bright and warm light. I am very pleased with the result. Alternatively, a low-priced solution was found from Banggood in China, from where I bought six 12V super white 0.4 watt bulbs and all six work fine; these are quite bright and hard to beat for the price. As a replacement gasket for the L516 lens, I acquired O-rings from a local hardware store (25mm ID x 30mm OD x 2.5mm) and trimmed them slightly to fit the lamp bezel. My choice was to use a Moss Motors conversion kit (US$99) for this two-function Lucas part L549. It did require a simple modification to remove the socket on the base but it was easy to install. The fit of new parts to the old base was very good and the resulting performance of the two critical functions is outstanding. An acceptable alternative to this solution of the Moss kit may be to use the existing bulb socket with Type-1157 LED bulbs (two-elements, one for brakes and one for tail lights). Type-1157 (and the single element Type-1156, as used in indicator lights) use bayonet connections just like the original incandescents. The recommendation is to select an omni-directional LED (emits from end and sides) and choose a red-coloured unit (not white) to avoid a ‘pinkish’ hue to the light after passing through the red lens of the L549. These parts are standard Lucas L594 Lamps and take LED Type-1156 (one element, two wire) omni-directional bulbs. Spare orange, red or clear lenses for the L594s are easily found at ‘swap meets’. For both front and rear, I decided to go with four orange Type-1156 LEDs such as the Moss Motors part number 170-936. On the front indicator lamps, with orange LEDs fitted behind clear beehive lens on the original L594 lamp sockets, the result was to achieve intense amber turn signal lights. On the rear, for reasons of aesthetic preference (i.e. to limit lens colours), I opted to use a red beehive lens in the L594 unit along with orange Type-1156 LEDs; this produces an intense reddish-amber indicator light, with enough orange colour to be distinct from the intense red of the tail light / brake light combination at the rear. White Type-1156 LEDs were tested but were found to produce a pinkish light when behind a red beehive lens. In sum, if using red, orange or clear beehive lenses, my preference is use orange LEDs. Further, on my car, ballasts were not required because of how it is wired at the dashboard with a single flash indicator bulb rather than two separate left and right indicator circuits. Note that it is necessary to change the original flasher to one with an electronic (two-pin) flasher. Such electronic flasher units are designed with micro switches rather than current resistance switch via a bi-metallic strip — the LED bulbs simply do not create enough heat to open the flasher switch. I confessed to my friend Bob Smith that I sometimes forget to cancel the manual signal switch on the dashboard, resulting in a prolonged and potentially misleading signal to traffic. The next time that he stopped by he had a DIY tiny beeper (removed from an ‘expired’ smoke alarm) ready to be wired into my flasher circuit. He even added an isolating switch under the dashboard so that if the beeper became annoying to the driver, relief is just a click away. Not only clever, Bob is very thoughtful. A noticeable improvement for lighting my licence plate was to use two Lucas L467 Number Plate Lamp Assemblies. These are mounted vertically on a custom aluminum plate to either side of the licence. Each L467 takes two Type-1156 bulbs, thus four are needed in total, in pure white colour and omni-directional design. Now the rear of my car is easily visible at night. While LED headlights are a possibility, I opted for a P700 Tripods Headlamp Set (a similar set from Moss costs US $ 140) and fitted with halogen bulbs. These are used in conjunction with a relay mounted in engine compartment so that relative high power does not go through the switch on the dashboard; thus, my original toggle switch on the dashboard is linked to the relay. High-Low Beam switching is via the original firewall switch but mounted to the back of the wooden dashboard for easier access. The P700s are very bright and so are carefully adjusted as not to ’blind’ on-coming drivers. There are at least two viable options for these dashboard lamps: 1. don’t touch them — leave the incandescent bulbs as they are; or, 2. remove the bulbs, perhaps the dash plate and gauges as well, and inspect the bulbs, sockets and grounding wires. I went with the second option by fitting my Dashboard Warning Lamps [Lucas 99-1207 red; 99-1208 amber; 99-1209 green] and Instruments with LED Mini Bulbs for the multigauge, speedometer, tachometer, and temperature gauge. It should be noted that Morgan dashboard mini sockets may vary: some being screwtype, some being bayonet with pins, and some being bayonet with ‘ears’. Mine were a mixture but mostly bayonet sockets with pins. In the case of any specific Morgan, the best approach would be to remove the bulbs, perform a close inspection of what is needed, and then place an order for LED replacements. Important to note, the single dashboard bulb that I left as original incandescent is the generator ‘low power warning bulb’ because, if this were to be changed to LED, the new relatively low operating current could give false indications of ‘low charging’. I departed from the original lamp and opted instead for a weather-proof 16-LED array that is intended as side marker lights for trucks and trailers. On this four-seater, I mounted the unit behind the spare tire, up high so as to be out-of-sight, aimed through the spokes of the spare, and down at the road. This lamp array is activated with a switch under the dashboard and it is effective to cast a pure white beam when it is needed. Conclusion: What would I do differently if again? The combination of LEDs and other lighting accessories on my Morgan is very much to my liking now. I would use the same solutions but concentrate my order through just one or two suppliers: Moss Motors (US) for the LED Tail Light / Brake Light conversion kit; and 4Sight Lighting Co (UK) for the LED warm white COB BA9S in the Front Side Wing Lamps. Either can supply the required number of Type-1156 and 1157 bulbs, and most likely the small LEDs for the dashboard. Combined orders will likely result in lower shipping and handling charges. Perhaps ‘old school’ but I have found that initiating orders by telephone will increase the likelihood that I receive what I expect. After converting to LEDs, if following Ol’Blue at dusk, have your shades within reach! Click the image to the left to download a .pdf version of this article, suitable for printing.